A clip from my first major publication! Roberta Birnbaum opened the opportunity for me and Linda Swingle embraced me with open arms. I can't thank either of you ladies enough for this amazing opportunity. I was asked if I could write for the General Craft Category. For me this meant a heavy amount of internet research, pinterest surfing and blog hopping. I wanted to see what the common thread was. It turned out that upcycling glass products was really popular. I love working with clear mediums so i set to work going through my cupboards, thanks to Niki of Pawsitively Creative, and her Altered Rusty Lava Bottle for some inspiration, I asked some family for their glass wine and liquor bottles. My Favourite was this wine bottle. Using my Fiskars AdvantEdge Punch System with the Ironworks Cartridge. Then applied the border to the wine bottle in a wrap. Next, I pulled out the Charred Gold Embossing Powder and my Emboss It Dabber by Ranger Ink. Apply the dabber and then dump the powder on. (Do this in smaller sections). Then heat with your heat tool, slowly and at a distance so you don't pop or explode the glass. The Ranger heat tool is slow and steady to get this started. I used my Wagner heat tool, but its industrial, sometimes I am reckless, but the result worked anyway. Repeat the process above all over. You will need to gently heat the powder on completion, around the ironworks sticker so you can slowly remove the sticker and create a clean break from the powder. There wasn't as much definition as I would want at the frost line so i started playing with stains to colour sandblasted area, Starting with my Dylusions Paint Pen. Yikes! That's not quite right. How about some red spray stain. Not Surprising but the Spray stain didn't work for this. Up next, my go to Ranger/Tim Holtz alcohol ink, Raisin. I have used 3 bottles of this one in a year. This worked awesome but in needed some decor. I made this Resin piece using a Prima mold and pouring Onyx Frost Embossing Powder in the bottom before adding the Ice Resin (by Susan Lenart Kazmer). After it was solid I heated it and melted the powder. the result was perfect. Then I heated the entire resin to shape it to the bottle. Adding a chain, part of a bracelet charm, and my super cute Violin Charm, the bottle is complete and has been travelling on display with me for a year. I absolutely loved this and I hope it lasts a decade or more with me. Like a fine wine. Before we announce winners, I am hoping you will take a minute and if you are able, please donate by clicking this link to the Red Cross to help with the BC Wildfires. These fires are destroying homes, livelihoods and finances for so many. Even members of our creative family have been evacuated or are still in danger of evacuation. Once we see the fires end and lives can begin to rebuild, will be doing giveaways and sponsorships to help people start healing by offering gifts of hope and love through creative healing. Fireworks & Sparks Dare with her Happy 4th of July entry. 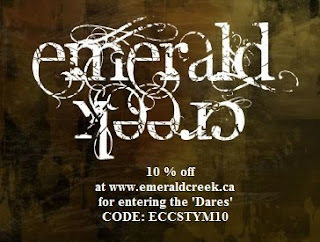 Drea please email Kim at info@emeraldcreek.co for your prize code. Congrats to all the winners!! Love the creativity that is shared on the EC challenges! WoW! Very cool that you were asked to do a project and I don't know about those ladies, but Boy oh boy! You sure WOW-ED me with this bottle! How very clever to mask off your bottle that way ! Kim this sure is a striking remake or upcycle project! Kim, what do you have in mind for your giveaways and creative healing projects? I would be happy to donate artwork if needed. Congrats to all the winners, and thanks so much for choosing my layout in the Top 3! It's so great you are bringing attention to the wildfires- so scary! Thanks for another amazing challenge- love the project! Awww! 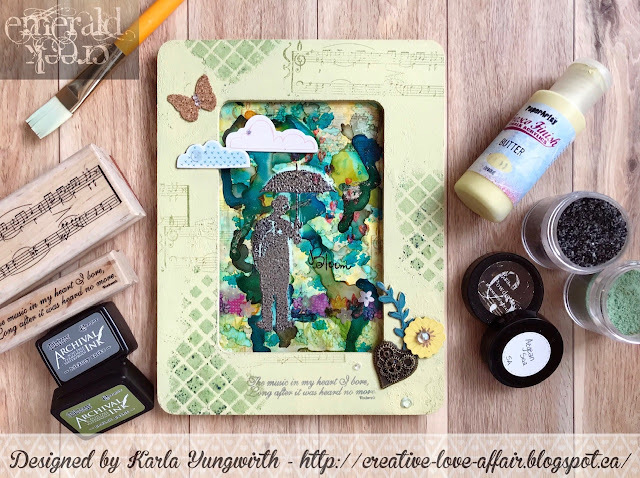 So sweet of you for the shout out and I am thrilled to have inspired! You know how much I love this altered bottle and then some. Now seeing it and the process and all makes it even more awesome sauce! The colors are gorgeously gorgeous and totes Wowzers! So sorry to hear about the fires. We are having fires near us as well. Last year some idiot set of some fireworks and burned up A LOT of land. My heart goes out to all the critters and everyone. I love the bottle, so cool! It's sad how bad the fires are this year. We just had all the smoke that was hanging around clear out. What a fantastic altered bottle - an amazing transformation... thanks for sharing your steps.